Copyright of the set is 2017. Top Notch is based in the UK. The Bf-109G was manufactured at three different factories in Germany, each with a distinct style of camouflage that can often quite easily be identified with a little help from their distinguishing marks. 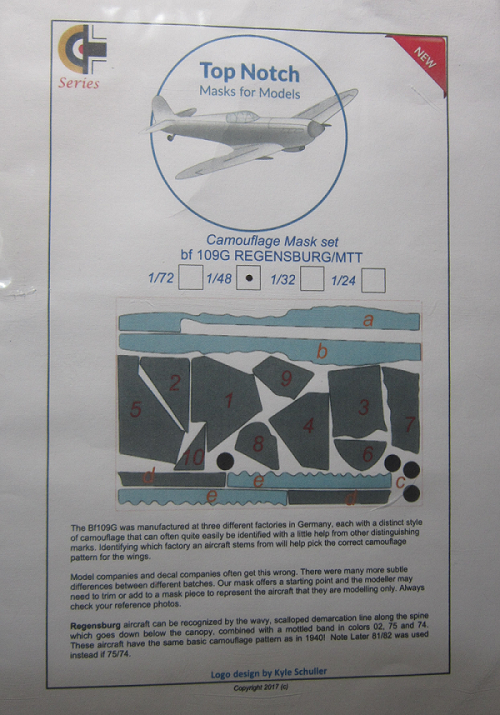 Identifying which factory an aircraft stems from will help pick the correct camouflage pattern for the wings. Model companies and decal companies often get this wrong. There were many more subtle differences between different batches. 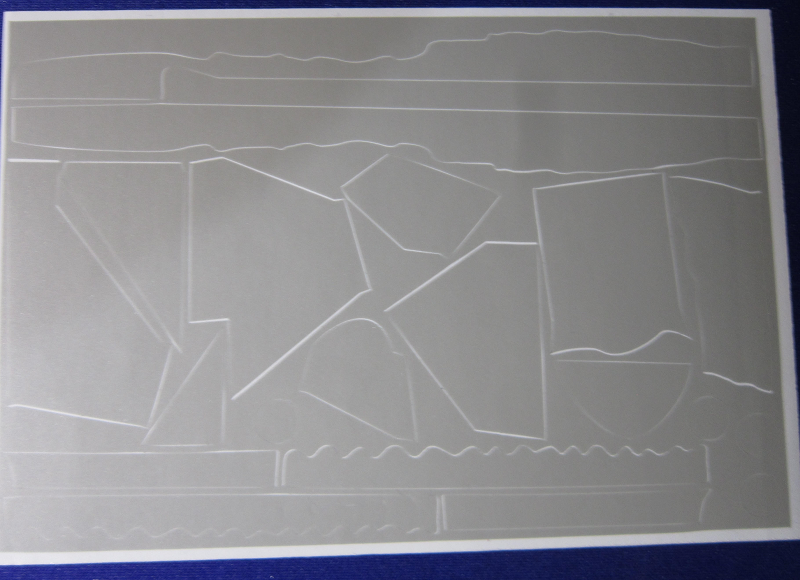 This mask offers a starting point and the modeler may need to trim or add a mask piece to represent the aircraft that they are modelling only. Always check your reference photos. Regensburg aircraft can be recognized by the wavy, scalloped demarcation line along the spine which goes down below the canopy, combined with a mottled band in colors RLM 02 grau (grey), RLM 75 grauviolett (grey-violet) and RLM 74 grungrau (grey-green). These aircraft have the same basic camouflage as in 1940. WNF aircraft are closest to the official specifications for the camouflage pattern. The demarcation line on the spine is more straight, with an even, often soft, mottle. Most noticeable on WNF aircraft is the pattern on the spine with the RLM 74 (grungrau - grey green) further back leaving the canopy in RLM 75 (grunviolett- grey-violet). ​The instructions consists of a single sheet that is printed on one side and folded to fit the envelope. On the right side at the top is a color illustration of half of a British roundel welded to half of a German cross, a corner says the set is NEW. Top Notch's logo is also at the top. It is a circle with Top Notch masks for models and a gray illustration of a Spitfire or Hurricane. ​Below this is a illustration of the parts in the masking set. There are 10 sections for the splinter camouflage, 2 sections for the wing leading edges, 2 sections for exhaust stains, 2 sections for wing walks and 4 circles for wheel rims. ​Logo was designed by Lyle Schuller and the copyright date of the set is 2017. 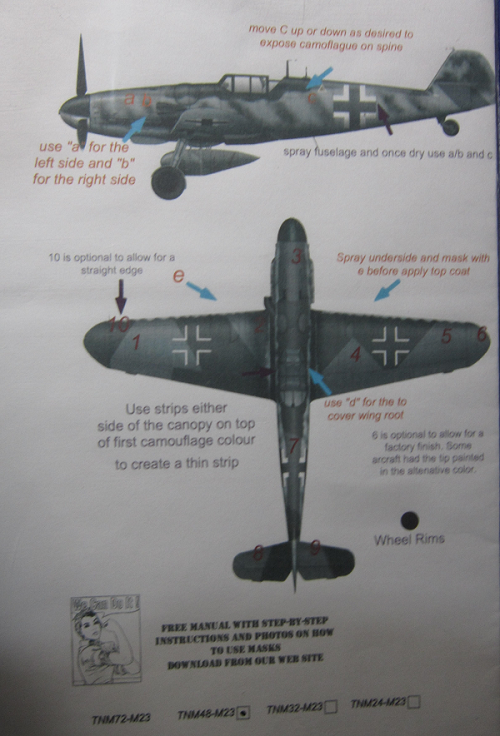 On the left side of the instructions is a 2-view of a Bf-109G Regensburg/MTT showing its side and top. Captions tell where to apply the masks. ​At the bottom free manual with step-by-step instructions and photos on how to use the masks can be downloaded from Top Notch's web site. A small illustration of a WWII propaganda poster appears. It shows a woman flexing her bicep and WE CAN DO IT!